Have you ever noticed how many birds turn over fallen leaves to find food? 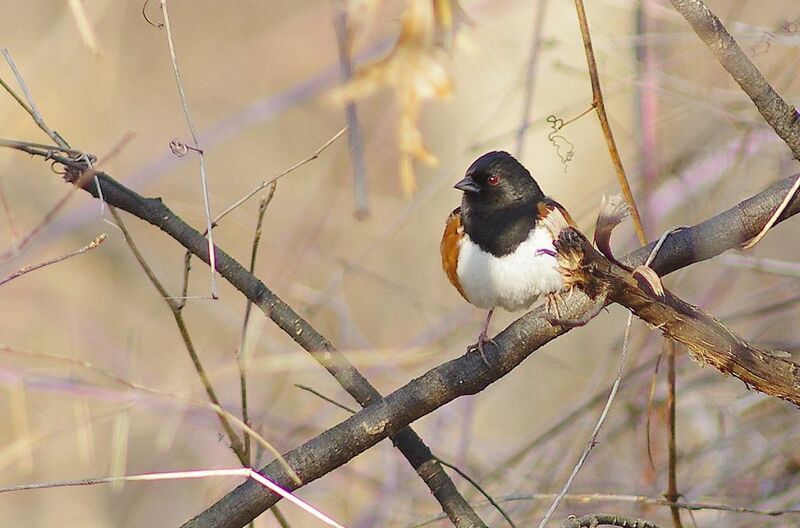 Towhees and sparrows, robins and wrens pick through the leaf litter to find overwintering insects. This food bank of edible insects is one reason why not to clear your garden in the fall. Fallen leaves also provide shelter for various live stages of butterflies, moths and bees. The Xerces Society’s Leave The Leaves campaign provides a list. Did you know…? 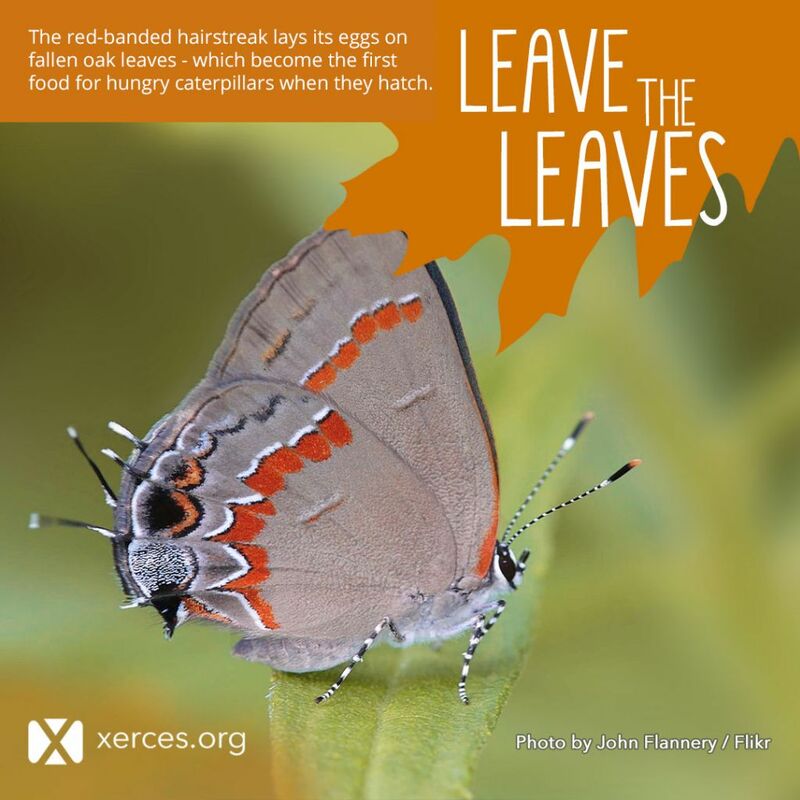 The red-banded hairstreak (Calycopis cecrops) lays its eggs on fallen oak leaves. 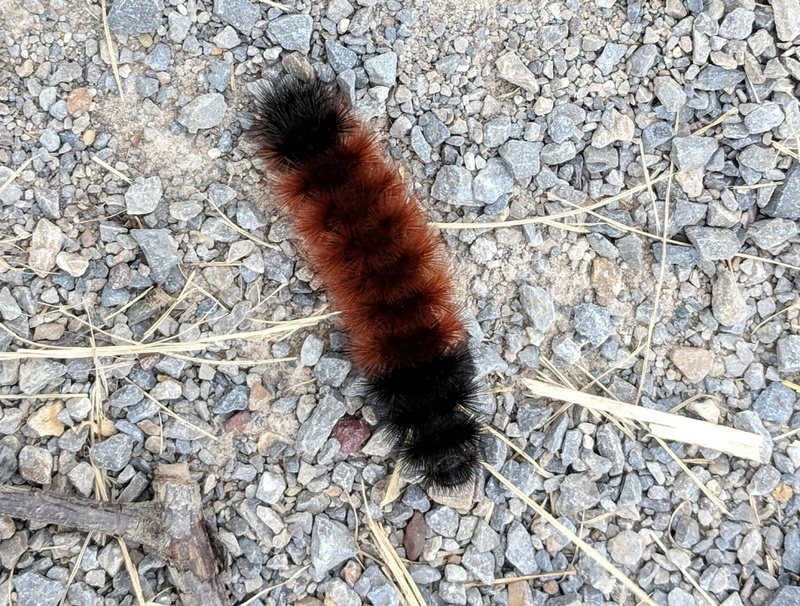 Woolly bear caterpillars burrow into leaf cover to survive the winter. And the moth version of this brown-headed owlet (Cucullia convexipennis) hides in leaf litter during the day to survive November temperatures. 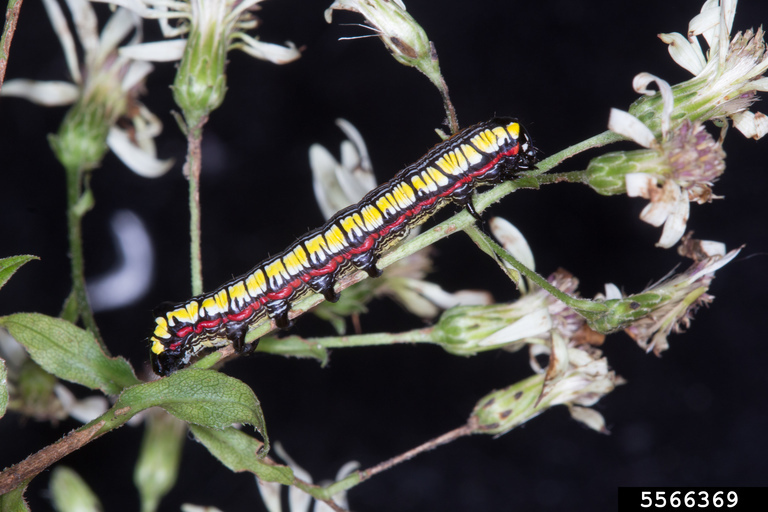 Moths in this family, Noctuidae, are the ones who pollinate witch hazel. So Leave The Leaves alone. Clear them from the storm drains, sidewalk and driveway, but not off your garden! Learn more at the Xerces Society’s Leave The Leaves campaign and at this How to Leave the Leaves blog. Thank you for sharing links to this beautiful campaign! So saddening to think of all those leaves, laden with lifeforms of all sorts, chopped up or crushed in landfills. And, I had no idea those adorable hairstreaks overwinter as eggs on fallen leaves! The Xerces campaign articles also link to a detailed chart of when it’s safest to move leaves from certain spots in spring, if you have to, while causing the least disturbance to insects just emerging after winter’s thaw. So helpful! Thanks so much for posting this, especially the links to the Xerces Society Leave the Leaves campaign. Every year I struggle with what to do with my leaves and every year I rake less. I was already planning to do some raking this morning, in light of the next Saturday’s Pittsburgh lawn waste pick-up but I am going to do a lot less raking thanks to your post. Easier for me and better for insects and other little critters! This is good stuff. I like the links. I have mostly cedar trees on my property, so not a lot of leaves. I actively solicit leaves from friends to bring to my property for composting and to use as bedding for plants and bushes. My blueberry bushes enjoy oak leaves which helps keep the soil acidic. I bag extra leaves to keep throughout the winter for composting purposes. This helps to keep methane gases down. I always leave any leaves that end up in flower beds and borders and rake minimally on lawn sections (which I keep to a minimum). I will try to “tidy up” later in the season as recommended. Sometimes I jump the gun on a nice day, but when I do “clean up” I just cut things down in a few beds and leave the material there. I do not remove it. Anyway……….good stuff. ps — The only plant that I know of that does not appreciate leaf coverage is the cardinal flower. The basal leaves of the cardinal flower require exposure to sun over the winter or they will die off. Fortunately, cardinal flowers are decent seeders so they just seem to move around a bit, but if you want them to come back in the same location, allow them some exposure to light.